EA has once again provided a beta for its NHL product, allowing eager fans a chance to partake in some HUT, EASHL, OTP and online versus play for NHL 17. The specific modes I’ve been checking out in particular are EASHL and OTP. The biggest change teased in this beta is the inclusion of customization features for both your player and your team’s arena. The idea is that you’ll unlock new gear, celebrations, goal songs and arena details as you play games — allowing you to spec out your team in a way that’s more distinct than in previous years. 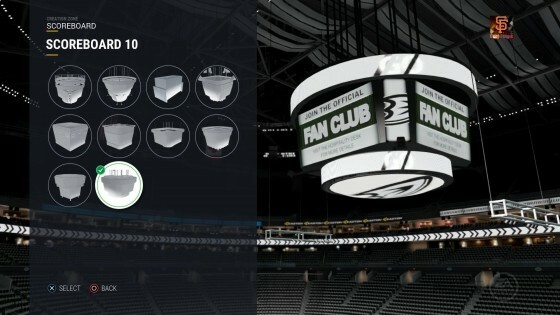 The arena editor seems particularly robust, facilitating the customization of seat patterns, scoreboards, ice logos, goal spotlights and many other details. It’s also nice, at this stage, to see an editor that lets you preview these changes quicker than something like the WWE 2K series, which often takes a bit of time to load up new elements for arenas and the like. Also welcome is the ability to float around in your custom arena when you’re all done, checking out sightlines and colors. Team logos and uniform colors can be edited, but there are some limits here. As you unlock new letters and logo types for your jersey, you’ll be able to change up how your team looks when it hits the ice. But the logos are fairly similar to custom offerings from previous years, and you can’t fully edit a logo (NSFW material being the likely fear here). The ability to change different color patterns and add details to the uniforms is nice, but the limits remain apparent. Still, our team has enjoyed having some choice in how we hit the ice, and that’s a good thing. For your specific pro, you can tweak the usual gear, and a lot of the previously available stuff has been put behind the unlock process to give you something to shoot for. It’s a bit annoying, but I can understand the change, as players will need a carrot dangled in order to have something to work for. This unlock process does have something meaningful, though, as there are 40 celebrations you can acquire. Some of the goofy ones, like dropping your stick to sign an autograph, are quite amusing, and these can be paired with some equally absurd goal songs (tropical music, anyone?). It would be nice if there was a little more variety in this feature, but the changes are welcome. However, many will be bummed that five-man celebrations remain absent this year. 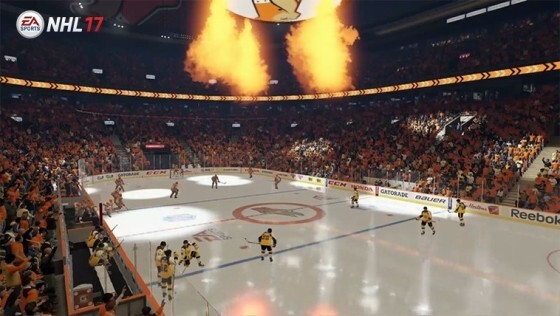 Once you hit the ice with your EASHL team, you’ll see plenty of changes from NHL 16. For starters, there are four new player types, including the puck-moving defenseman, the jumbo playmaker, the two-way dangler and the hitting sniper. These additions feel nicely considered, as they allow people to find that middle ground between some of the extremes of the returning player classes. You may have found a playmaker too soft last year, so the jumbo playmaker gives you some stability while making those passes. He can’t hit, but he’s like Joe Thornton, so he’s a presence. I’ve also found some good success on defense with the puck-moving defenseman, who has good breakout passing, and overall hand skills but limited defense. The gameplay in the beta certainly seems faster, with players skating easier and turning quicker. There’s a weightless feeling to some of the movement that I think I’m kind of warming up to, but I’m not completely sold. The ability to pass the puck and cycle along the boards is noticeably better, and shots seem quite fast. Some of this speed has translated into hits for even some of the softer classes, which is something the development team might want to look at before release. Similarly, the defensive play is affected by this speed. After a good number of games with my team, I feel the poke check is currently too effective, particularly for player classes with questionable defense. Once again, a power forward can muck things up by skating into people and can also stick lift and poke check with little fear. The addition of net battles and the tweaked feel on hitting has added some tools here, but I’d like to see classes truly have strengths and weaknesses, which currently isn’t entirely the case. Goalies are changed meaningfully this year, as a team will now be penalized with a smaller AI goalie if their manual goalie leaves the game — a welcome change. Controlling a goalie has been improved by a tweaked camera angle and some quality-of-life improvements, such as adjusted movement speed and post-to-post handling. But as always, manual goalies aren’t for the faint of heart. You have to know what you’re doing to attempt it. The new animations on the goalies are noticeable, with shots up high being shouldered down, and some pretty wild split saves and sprawls. What I have found is that wrist shots are going in far-side shelf (and short side) with a bit more regularity, making me wonder if the AI of the goalies needs to be beefed up for online play. Getting a hat trick with my puck-moving defenseman made me feel as if something wasn’t quite right, and I’m seeing plenty of teams flinging shots in from further than previous years. The goals aren’t completely overpowering the defense, but I’d say the balance isn’t quite right as of now. The AI, for all its been derided in previous years, does seem to help if you don’t have a six-man squad. CPU defenders provide more support along the boards, and they are getting in the way and jarring pucks loose more than before, which is nice to see. They still do panic when they get the puck and are facing the boards, but I am happy to see some progress in this area. Our team has been promoted up a few divisions so far, and we’ve generally been having a good time with the game. There have been plenty of exciting sequences, and the hits keep us laughing from game to game. I’m glad to see an emphasis on improved puck movement and skating, but I would like to see some of the goalie positioning improved. The class-based nature of the game still seems like it’s not quite committing 100 percent to what it purports to do, as defense is an area where some characters just aren’t penalized enough for their alleged deficits. But the action is satisfying, and this is coming from a team who has played in the league every year of its existence. We’ve also had a chance to check out some OTP action, which features a few changes. One big difference is the ability to group matchmake in OTP, allowing you and some random friends to step away from the EASHL and play together. Additionally, the mode now forces people to pick forward, defense or goalie before matching, which alleviates people leaving matches when they don’t get the spot they want — a smart design change. There’s also a rollover lobby, where you and some randoms can keep playing together if you like, which is also a smart addition. The matches still have the same highs and lows as OTP has had before, and your fun will depend on how cooperative your teammates are. Latency in OTP and EASHL hasn’t been an issue for our team, which is located on both the east and west coasts. There’s even a new network connection interface in the start menu, and you can see your average ping and recent packet information. The start of each match does seem to stutter a bit, but then it quickly sorts itself out. We’ve had a few lock-ups during the opening cinematic, and one or two people have lagged out, but this has occurred rarely. Matches seem quite smooth, all things considered. 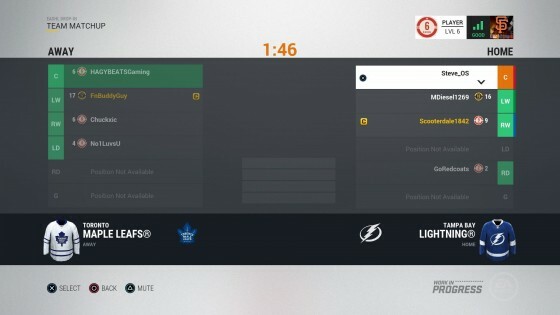 The added customization features present in the beta should appeal to EASHL fans, as it’s nice to finally have some control over your jersey and arena. Even if some of the options are a bit limited, you should be able to feel more unique as you try and hit those higher prestige ranks. The action on the ice has changed due to the goalie, skating and passing tweaks, and the added player classes are welcome. The goal frequency and defensive punishment for some player types needs to be addressed, but what’s here has been entertaining for a longtime squad of EASHL players. I’m looking forward to the full release.